Scotland prop Geoff Cross has revealed he is content to remain with Edinburgh after agreeing a new one-year deal. The 26-year-old has become an integral part of the front row since making his debut for the club in December 2006. "I'm pleased to have extended my contract with Edinburgh and I intend to continue to grow as a player in an excellent environment," he said. Head coach Andy Robinson said Cross had developed in the past year and that he expected him to improve further. Cross, who earned his first Scotland cap this year, said he believed remaining at Edinburgh would help him fulfil his potential. "We've got some great facilities at the club and the team is making exciting progress," he said. "I believe it is the ideal environment for me to pursue my dream to represent my country again in the future and achieving my goals as a player." 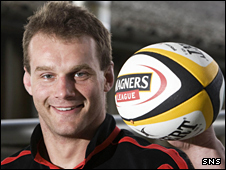 Robinson added: "He showed in his performance against Connacht last week that he really wants to play for this club."